An underage drinking ticket can result from anyone under the age of 21 (a minor) consuming or carrying any type of alcohol — no exceptions. While the legal limit in the State of North Carolina is 0.08% BAC (blood alcohol content), if you’re under 21, any amount of alcohol is grounds for getting a ticket. Do I need a lawyer for an underage drinking ticket in NC? Underage drinking is viewed with a “zero tolerance” attitude by judges and law officials across North Carolina. The damaging effects that an underage drinking charge could have on a person’s future are serious. Once someone receives a drinking ticket, it can be difficult to remove from showing up on a background check, which can affect their job search, getting a loan, and more. Not to mention, the fines and penalties for drinking underage can be substantial. Mishandling a drinking ticket can have a permanent effect on your record. In some cases, community service is required by the court, which can be a burden on work or school schedules. Consulting with an experienced lawyer that is familiar with NC underage drinking cases can make a difference in the possible outcome. I had alcohol on me, but did not drink anything. Can I still be charged? Yes. The statute regarding underage drinking deems that anyone buying, possessing, or consuming alcohol under the age of 21 can be ticketed. Buying alcohol with a fake I.D. or simply possessing it as a minor can be as serious as if you’ve actually consumed it. The legal system, especially in Wake County, does not look lightly on these offenses, which is where an attorney can help. What are the consequences for drinking underage? While underage drinking laws vary from state to state, North Carolina classifies underage drinking offenses as Class 1 or Class 2 misdemeanors. If driving was involved (DWI/DUI), the consequences are more severe. The consequences one receives for a drinking ticket can depend on variables, such as if the person has a previous criminal record or if they are a first-time offender. Our attorneys will carefully review the factors of your case and work with you to determine the optimal course of action for your situation. Acts of good faith like attending alcohol counseling classes before your court date may help your case, showing the court that you understand the severity of the charges against you and are taking proactive action. Factors such as these are important when facing an underage drinking or DWI ticket, and can your attorney can help guide you through the process. Can I use a Prayer for Judgement (PJC)? A Prayer for Judgment Continued (PJC), also referred to as simply, “Prayer for Judgement,” is typically reserved for traffic violations, such as speeding tickets. Learn more about what a Prayer for Judgement is and when to use it. A concerning issue for young adults who get charged with underage drinking is the impact that it will have on their future. Many employers conduct background checks before hiring, which can be a problem if someone has a drinking violation on their record. It is possible to reduce the negative mark or remove an underage drinking charge from a person’s record. Through legal processes like a deferral or expungement, there are options available for removing an underage drinking offense or DWI. I was charged with underage drinking. What do I do now? The first step to protect your future and receive the best possible outcome for your drinking ticket is to consult with an attorney. Read more about underage drinking tickets in NC here. 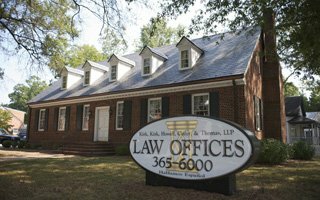 The criminal lawyers of Kirk, Kirk, Howell, Cutler & Thomas, LLP have seen many underage drinking cases in Raleigh, Wendell, and statewide. Our attorneys are with you every step of the way and strive to obtain the best possible outcome for your specific case. If you have been charged with underage drinking, our Raleigh lawyers are available for a consultation by calling (919) 615-2473 or by completing the online contact form. Don’t wait until your court date is right around the corner. Speak with one of our attorneys today.